Summer is in full swing: It’s time to talk about…Port? Too often, we think of this as a cool-weather wine, a glass to comfort chilly bones in the middle of winter. But opening up a nice bottle in the summer can be a real treat and a welcome break from the more typical wines that most of us tend to drink this time of year. I recently had the chance to savor a serious glass of Port, and, honestly, it wouldn’t have mattered if it was 120 degrees out that day or 32: This wine was delicious enough to work in all types of weather, and seemed to embody the idea that it’s never the wrong time to pop the cork on a great bottle. As with the Lafite last week, I tasted this one with my friend Scot “Zippy” Ziskind of ZipCo Environmental Services, Inc., the renowned custom cellar firm, at a monthly tasting club he hosts. And, as always, once the wines of the evening had all been consumed, he brought out a well-aged bottle of Port, in this case the Graham’s 1986 “Malvedos” from the famed vineyard in the Upper Douro. Incredibly, the wine still showed a serious touch of youthful exuberance, even 23 years after the fruit was harvested. Dense aromas of warm blackberry conserve with hints of coffee, cinnamon, beef jerky, and cigar tobacco rose from the glass. Blackberry, cinnamon, and sachertorte notes followed through to the palate and led to more beef jerky and whole black peppercorns on the finish, as well as ethereal hints of lavender perfume and vanilla. This is a fabulously structured wine, still fresh, generous, expansive, and promising another 15 years or more of evolution. But, really, who can resist it now…even in the middle of summer? 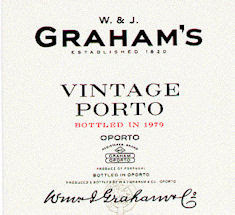 Thanks for sharing the reviews of Graham's Vintage Port 1986 "Malvedos". It looks great. Being a wine lover, I enjoyed going through your blog. Keep it up the good work.